Take this four to five hour round trip to the Wedge Overlook. Here you’ll see what locals affectionately refer to as Utah’s “Little Grand Canyon”, the San Rafael River’s deep cut, and the resulting gorge. This adventure will take you across the northern rim of the swell. As you approach the Wedge you’ll pass the Cedar Mountain to your north. The flat between the swell and Cedar Mountain is full of history and wildlife. The Old Spanish Trail, a historic trade route from Santa Fe to Los Angeles, passed along this flat in the 1800’s. You’ll also follow the old railway grade for much of the drive. On the return journey you’ll drive the Cottonwood/Buckhorn Wash Roads. As you travel through this high walled canyon you’ll notice tracings left behind by the many travelers before you; outlaws, Native Americans, and even the mark of one prehistoric visitor. From Green River, head west on Main Street. Before leaving town fill up on gas and provisions as this trip requires nearly 4 hours of scenic driving, without services. When preparations are made, head west on I-70. Take exit 157, merge onto US-191 N. Reset your odometer, all milage approximations to the wedge overlook are taken from this point. At mile 17.1, turn left onto Green River Cutoff Road. In about a mile, follow the road as it takes a sharp left, cautiously cross the railroad tracks and take the first right to continue on Green River Cutoff Road. Green River Cutoff Road twist, cuts, and climbs over the next 27.3 miles. When your odometer reads mile 21.7, look up to your left at the balanced rock formation known as John Henry’s Hammer. At mile 23.8, also on your left, is the towering formation, the Ziggurat. At 30.9 miles, directly in front of you will be the Cedar Mountain and the lone Chimney Rock butte. At the 45.9 mile mark, you will approach the Buckhorn Wash Info Center. Take a left. In approximately 6 miles you’ve arrived at Utah’s Little Grand Canyon and the Wedge Overlook. Once you have come to fully appreciate the San Rafael’s natural wonder, return to the intersection of Wedge Overlook Road and Green River Cutoff Road, where the Buckhorn Wash Information Center is located. Take a right. Take the first right, onto Buckhorn Draw Road. Reset your odometer, all mileage approximations along Buckhorn Draw and Cottonwood Wash Roads are measured from this point. After 1.6 miles a small sandstone ledge (approximately 15 feet) rises just east of the road. Park your vehicle and take one of several paths to the top of the ledge. With a little searching you will soon find a large and clearly visible prehistoric dinosaur track. At the 4.2 mile mark, look to the sandstone wall which rises above the road to your left. Just above the lowest accessible ledge is the inscription “MAT WARNER FEB17 1920”, visible from the road. Matt Warner was an outlaw who operated in the area. Matt often spent time in Green River, along with notorious outlaw and coconspirator, Butch Cassidy. In Green River Matt owned several disreputable establishments on Long Street. For more information on Matt Warner and the colorful history of Green River, take Green River’s significant sites tour [link to come]. Continuing on Buckhorn Draw Road, at the 5.5 mile mark you will approach a vehicle pull off and information kiosk. This is a significant pictograph panel, which is nearly unparalleled in the area. The panel speaks for itself; however, it is recommended that would be viewers visit during the long light hours of the evening for the clearest exposure of art on the rock surface. At 9.2 miles, you will cross the San Rafael River, the road from this point is named Cottonwood Wash Road, look to your right as you cross the river, you will see a bridge built in 1938 by Civilian Conservation Corps men. On Cottonwood Wash Road you will soon be entering a beautiful section of open desert. High buttes rise sporadically, a prevalent herd of wild burros occupy a section of the road ahead, keep your eyes out for signs of their presence. These hardy donkeys are the descendants of a truent band who escaped their lives as pack animals while traveling the Old Spanish Trail in the mid-1800’s. In 28.3 miles Cottonwood Wash Road intersects I-70. To return to Green River, head west on the Interstate. 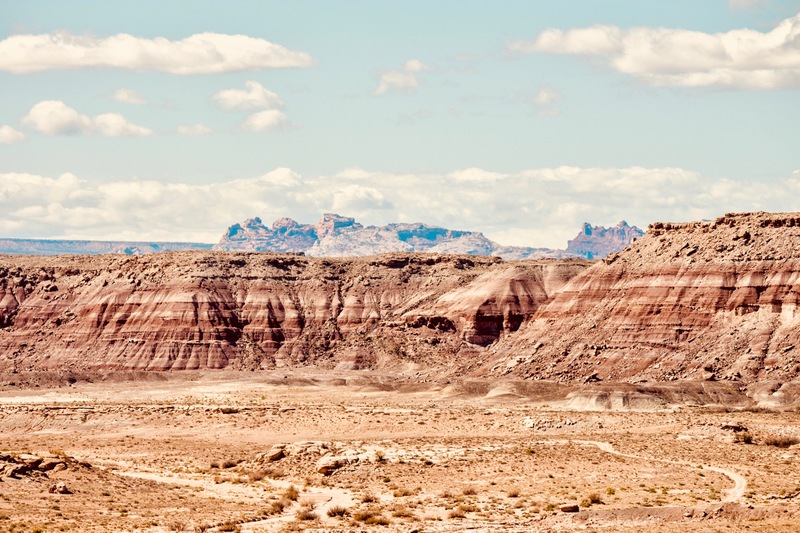 Just before crossing through the San Rafael Reef, there is an Interstate pull off and overlook area. It is recommended that you take this opportunity before arriving at your destination, Green River. Stop at a nearby staging area and run one of the many OMV routes in the Swell. Mountain Bike one of the surrounding Swell’s world class trails, visit www.biketheswell.org for more information.